I came across a lovely lady named Rebecca the other day. She has a fantastic website Build A Nest. 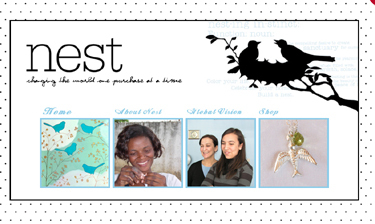 In their words: "Nest is a nonprofit organization dedicated to changing the lives of women in developing countries. The mission of Nest is to support women artists and artisans in the developing world by helping them create sustainable entrepreneurial businesses. To do this, Nest provides micro-credit loans to be used for the purchase of the supplies and materials necessary to begin and/or maintain art or craft-based businesses." Isn't that the greatest thing you've ever heard?! A totally win-win situation. Her shop is loaded with original products and definitely worth looking through!